Here’s a story for those of us who enjoy macabre fingers stroking the backs of our necks now and then. Before I knew about the alleged murder, I waded in a picture postcard, knee-deep in the Mendeltna Creek and tranquility. My fly line drifted carelessly downstream, and a cadence of “whooshing” wings invited my gaze upward where wind splattered white clouds violently against a rose-colored sky. An eagle dropped low to observe me, and pleasure settled deep in my soul, a feeling as keen as a tapered fishhook. 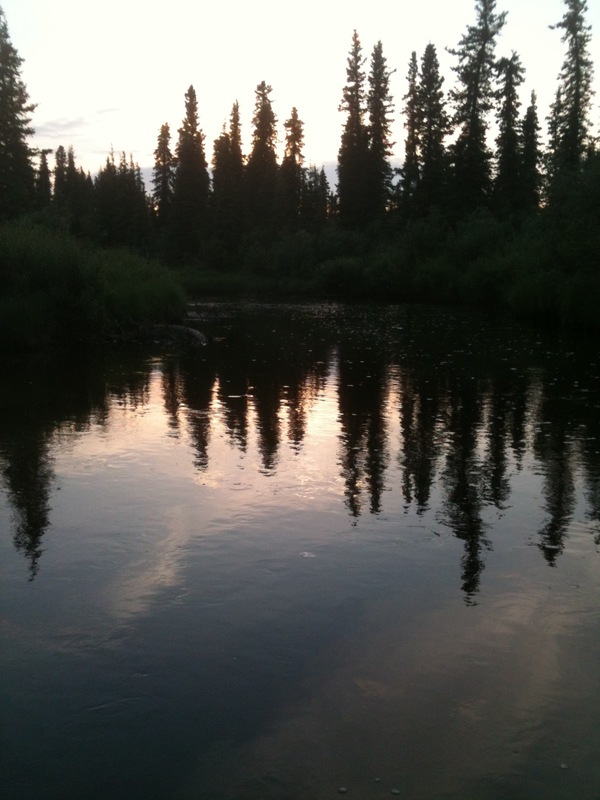 I willowed my fly rod serenely, confident that Arctic grayling schooling in deep pools stalked my undulating black gnat. Suddenly, a “flump,” like a body flopping into a hot tub, startled me. A beaver the size of a yearling black bear stared balefully at me. The troubled rodent patrolled back and forth, daring me to pass his den. My black gnat eddied up to this guardian’s muddy doorstep, a murky hole in the side of the bank, and I reeled my line away. His tail, as wide as a dory paddle, slapped the Mendeltna, and I lost no time slogging to the opposite bank to avoid a confrontation. I glanced around for a land route back to my creek-side camp. More and more beaver tails pounded the water’s surface, while a silent curtain of dusk slowly draped the catacombs. And why were the schools of grayling lying so motionless upon the bottom of the creek? I bumped them with my shins as they floated—alive, but acting dead—staring up at me with lidless eyes. They seemed terrified, caught in a net of suspended animation, unable to strike at flies, gnats and mosquitoes that were teeming at the slow Mendeltna’s surface. I floundered up a slippery, unguarded rodent trail, and bushwhacked against a macabre current all the way back to camp. I locked myself in my camper, shaken. Neighbors called Elmer Haab a killer. Alaskans, living at mile 150 of the Glenn Highway (near the old Moose-A-Boo Garage), remembered Elmer as a bear-of-a-man who could lift car engines single-handed. In the Lower 48, Elmer had been a safecracker and served prison time in three states. In the 60s, Elmer and his gentle, petite wife, Bonnie, served drinks at their lodge called the Mendeltna Roadhouse. Some months after Bonnie went missing from the Mendeltna community, Elmer confessed to Alaska Troopers that his wife “fell, hitting her head on a water pump.” He had tucked Bonnie into bed, and the next time he checked—she was dead. He was right when he figured that no one would believe him…. A “friend” and he hauled Bonnie’s body to a gravel pit, where they piled brush and wood on her corpse. They kept Bonnie burning for two days, until mostly ashes remained. Elmer shoveled her ashes and charred bones into an oil barrel, then dumped Bonnie into the slow-moving Mendeltna Creek. During Elmer’s plea bargain, he took detectives to the cremation site, and watched the lawmen sift through ash-laden gravel. A .44 caliber slug suddenly dropped through the wire mesh, and clanged in the bottom of their metal drum. Because locals used the gravel pit for target shooting, prosecutors fell short in charging Elmer Haab with first or even second degree murder. Elmer and his lawyer likely maintained that the .44 lead belonged to another shooter who shattered bottles at the gravel pit. Elmer Haab was sentenced to 10 years in an Alaskan prison—for manslaughter. Some fishermen claim that Bonnie Haab appears alongside their own reflections as they stare into shallows of the unhurried creek. A sinister ambiance pervades the Mendeltna, where malevolent beavers grow to unnatural sizes, and Arctic grayling bite in frenzied waves—or not at all.